Gran'pa Knows Best is viewable on HBO GO and HBO NOW! Just navigate to LATINO SERIES and you can see all 30 episodes. This innovative character-driven hybrid features miniature ‘Gran’pa’ leaving a series of humorous voicemails for his grandson Davy. After several rambling messages go unanswered, Gran’pa leaves a final voicemail expressing his anger and frustration at Davy’s refusal to call, claiming that he has forgotten his poor Gran’pa. Sitting alone defeated, Gran’pa’s phone finally rings, leading to a warm conversation with Davy as the end credits roll. The show is currently being turned into a webseries called Gran'pa Knows Best! More details forthcoming. One of the more remarkable talents is from Newark, William D. Caballero, whose short film, “How You Doin’, Boy? Voicemails from Gran’Pa” has been showing up in various film festivals lately. The video is about Caballero’s Puerto Rican cultural roots, told by real voicemails left by the artist’s grandfather on his answering machine. Gran’Pa grows increasingly angry — and funny — as Caballero fails to get back to him, and the story, animated with 3-D printed caricatures of Caballero’s Gran’Pa on a handmade set with an enormously distorted telephone, carries real comic punch. Caballero is turning his animated storytelling into a website that will feature regular stories about his heritage. Spanish languge interview for Indice, a Puerto Rican media newspaper/website! 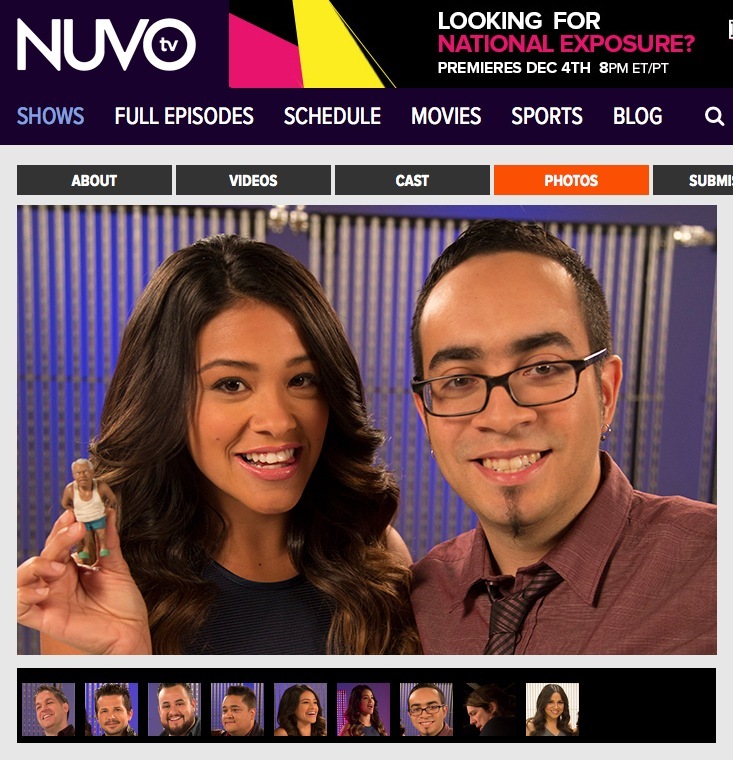 The short film was recently selected for NUVO TV'S EMERGING LATINO FILMMAKER'S SHOWCASE! I was flown out to Los Angeles to be interviewed for the show by Gina Rodriguez, star of Jane the Virgin. The interview will be posted in late-November. Caballero, his wife Kate Keisel-Caballero, and 3D modeler Chang Kim, upon receiving the award for BEST ANIMATION at the 2014 Art of Brooklyn Film Festival.
. A photo reference of Caballero's Grandfather Victor is given to a 3D modeller (Chang Kim). 3. Gran'pa is painted digitally as a reference detail. 4. Gran'pa is then 3D printed in polymer resin at 3 inches tall, each print taking 4 hours to create. 5. The 3D print is hand painted by Caballero using a variety of acrylic paints. The voicemails used are actual voicemails left on my phone, which congratulate, scold, and offer words-of-wisdom across a variety of topics ranging from birthdays to trips to Puerto Rico. None of the audio is staged, and no actors used. 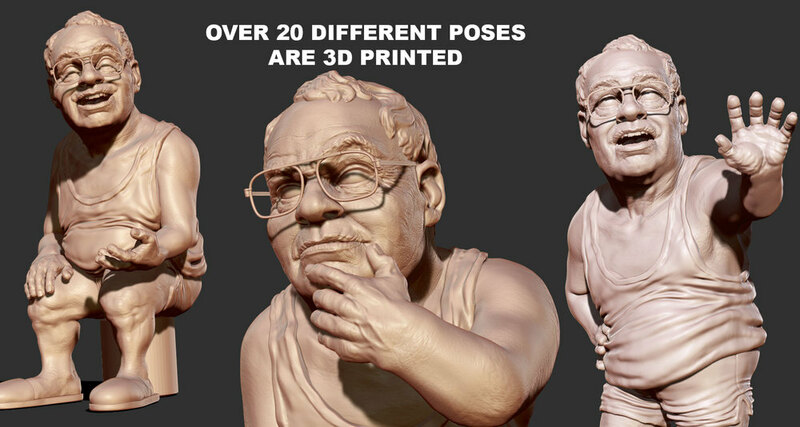 The film is shot using 20 different poses of Gran’pa created by a 3D modelling specialist, 3D printed in polymer resin at 3 inches, and hand painted using acrylic paint (below). These poses are then inserted into a human-scale Latino retiree apartment (plastic sofa coverings and religious Santa Maria candles abound), setting miniature Gran’pa amongst a larger-than-life backdrop. The photos below demonstrate how each character is developed from computer conception to physical object.